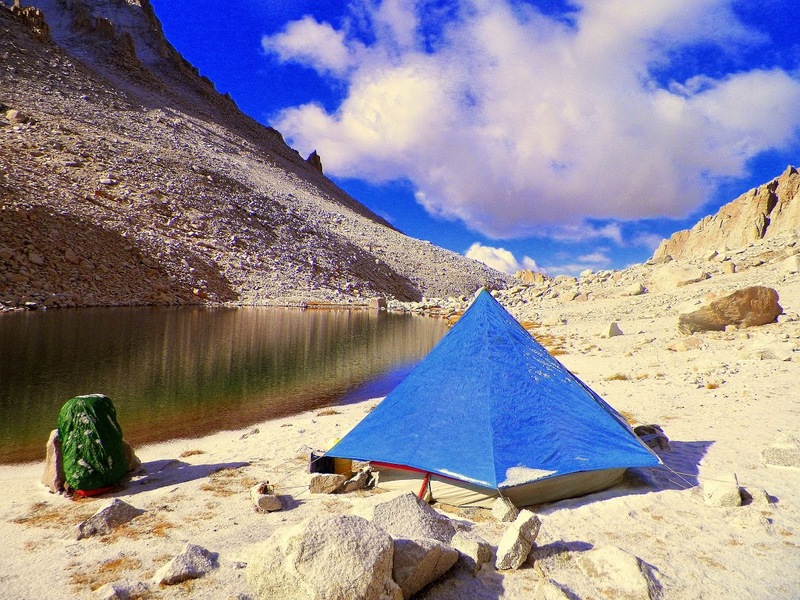 In five decades of mountaineering in the Sierra Nevada, the wilderness has changed from a wild west dominated by cowboys and pack trains to a highly regulated theme park with lotteries for permits to visit the most desirable locations. With feet in both these worlds we seek to circumvent the regulation, in a sense the opposite of wilderness, yet leave no trace. Mountain guides call folks possessed with the notion climbing peaks, “pointy heads”. 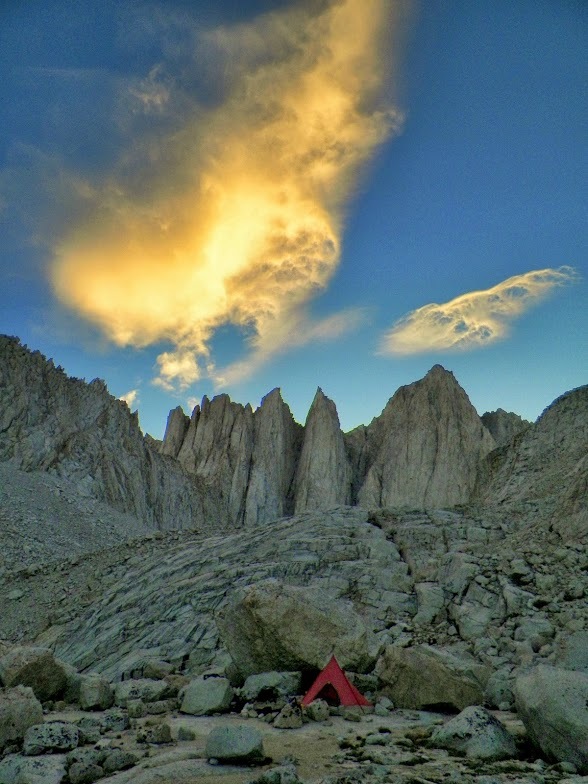 At age 16 such possession led me to run up a boulder chute on the west face of Mount Whitney for my first ascent, gaining a brutal headache. Time and many ascents have rounded my point, but we all have in us a little bit of what drives the many pilgrims to be found flagellating themselves as they stagger up the trail to the top. We chose to circumnavigate the mountain because it was easier to get a permit, and to avoid until the last exit day the hordes of pilgrims and what they have collectively visited on the landscape. To do this we entered via the North Fork of Lone Pine Creek, an approach that quickly filters out the casual with The Ledges. These are technically easy, if a bit awkward climbing over trees jammed into cracks, but exposure in a couple places forces you to look your own death squarely in the eye. Eerie clouds over Mount Whitney (right background) were the harbingers of powerful winds promised by forecasts of a coming storm. We carried our packs over the “knapsack” col separating Mounts Whitney and Russell before the storm arrived and descended the glacial cirque leading to Guitar Lake on the west side of the mountain. An early morning shower left a quarter inch of snow and we had a full day of winter as winds whipped flurries and 15 degree air as the storm reached a crescendo leaving two inches of snow. Then it was over and the night turned clear and cold. Our shoes crunched through the two inches of snow as we left camp for the climb. 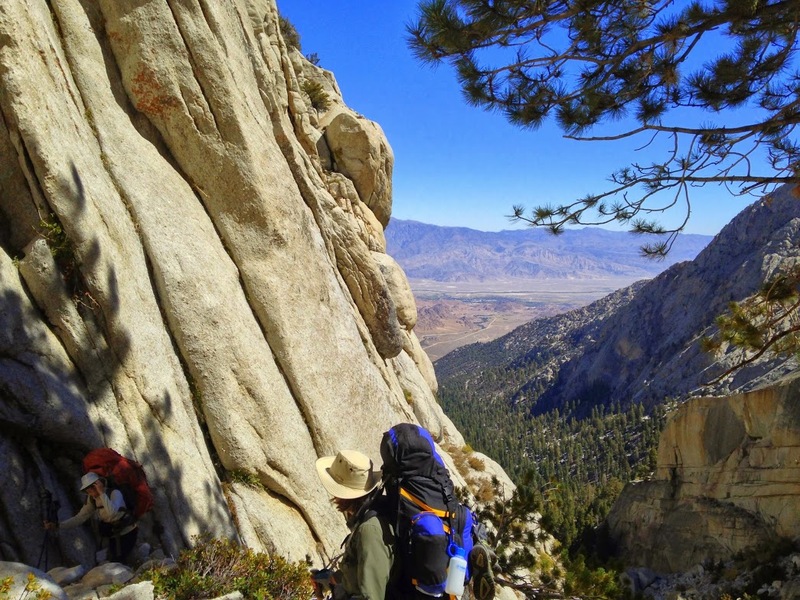 We met only one man, the second we had seen since the parking lot at Whitney Portal, on the climb up the west side to Trail Crest. Here we joined the regular pilgrimage and dire warnings from earnest young people of savage winds failed to verify. 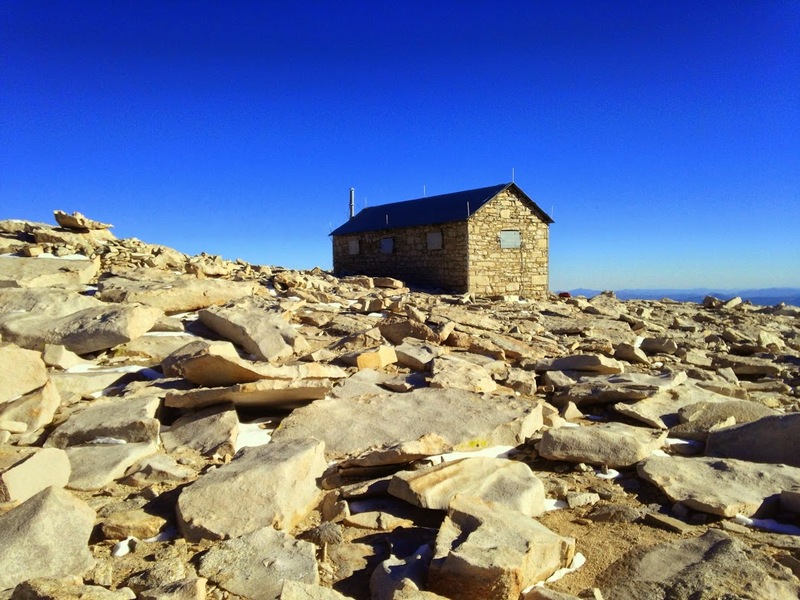 The weather was on a roll and we reached the summit in weather suitable for a down jacket picnic. 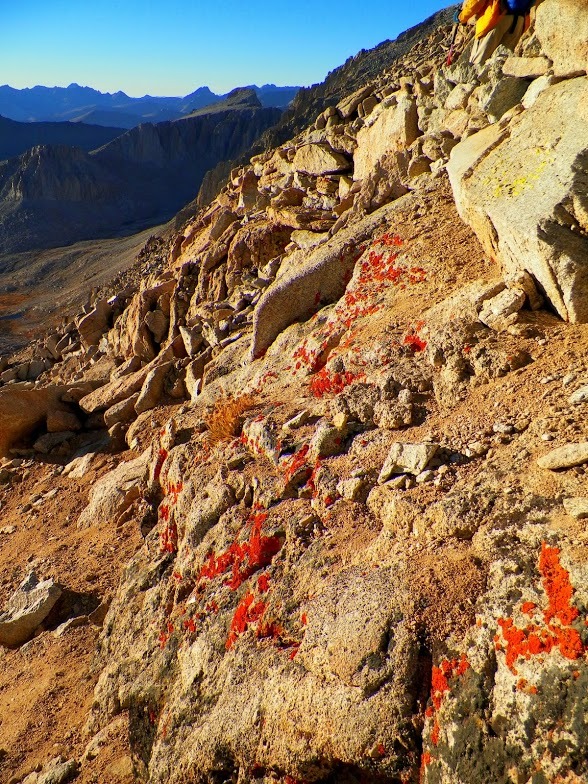 The beautiful light in the solitude of our descent back down the west side to camp, fluoresced the lichens, busy eating rocks, unnoticed on the way up. We rejoined the pilgrims the next day on the way down to the cars and they were a source of hope and inspiration. They had entered many lotteries to get their chance. The fit young couples brought back memories. The presence or absence of natural tolerance for altitude is evident in body language. We were all pilgrims on the same path now. We had just taken a more circular route to get there. 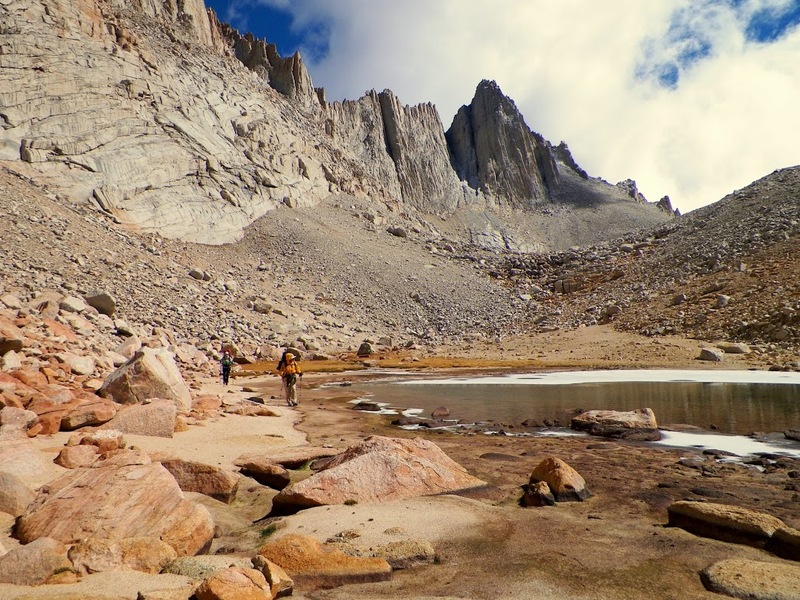 This entry was posted in Anthropology, Geography, Geology, Mount Whitney, Wilderness and tagged Hiking, John Muir, Mount Whitney, Mount Whitney Trail, Whitney Portal, Whitney Portal California. Bookmark the permalink.